In October 2010, a new German sourcebook on Berlin will be released for Shadowrun by Pegasus ([link]) which will not only contain the most awesome city setting SR has ever seen (and one of the most useable sourcebooks, too) but over 90% of raben-aas artwork. The picture here is the double-page introduction to the anarchist half of the book, showing a member of the "Kiezwehr" (a kind of alternate policeforce/neighborhood watch/paid gang member) at a monorail station in Kreuzberg. Tostec, I'm from Germany. Stattbus is perfectly fine. It's a wordplay on the term "Stadtbus" (city bus), replacing "Stadt" (city) with "statt" (instead of). It's the term of the anarchists in Berlin for all things that are alternative in any way. So you have Stattbus for alternative bus services, Stattbad for an alternative public bath etc. Is Berlin still like this in current books, or as I heard, the 'powers that be' pushed for that.. cleansing? There is the Berlin of the old Germany sourcebook (around 2052-54) where Berlin is an anarchistic hellhole with some high-security corporate sections inbetween. THEN, the corps pushed back and tried to take over the city, but failed in taken it whole: the eastern half was walled off, keeping the anarchists in, while the corps worked hard to turn the Western part in a Corporate Utopia that would show the "old" (democratic) governments how the corps are SO much better at running things. This was in the late fifties to the late sixties (think "Cold War meets Snake Plisskin"). During the years, Berlin became a nightmare for the corps: Yes, it's INCREDIBLY expensive to rebuild a city and turn it into a corporate Utopia, esp. since even the non-anarchistic Berliners are, well, BERLINERS and not all too keen to behave, or follow regulations, or having any of that polish your boots, snap to attention, be an example bulldrek. Ultimately, the corps realized that they would never be able to take the whole of Berlin, and if they would actually succeed in taking control of the anarchist Eastern half that would basically force all of them into bancruptcy (not really, but the figures looked like a Return On Investment would be possible somewhere around, oh, year 6.832 after the death of Golmukh the Great, so...). A terrorist attack with nanites (a solid 15 years before CFD, we are talking SURTR here) brought Berlin to the brink of yet another war between anarchists and the falling number of corporations in Berlin (some were swallowed, some withdrew from the Berlin project), so there were a load of round table meetings and a new truce was signed, leading to the current "Unity" of Berlin (since 2071) where there are corporate districts, anarchist districts and "normal" districts and everyone can pretty much do as he pleases within his own area (the system is set to harmonize regulations, standards and law(!) across all areas of Berlin, but there are a lot of veto rights, and since NEITHER the anarchists NOR the corporations want to give up their (quasi-)extraterritorial status in Berlin, the arguments about that are pretty much done for the cameras. It's not very likely that the corps will "push" for anything in the near future, except, maybe, the BERVAG, the huge administration corporation of Berlin that is controlled by the Senate where corps, anarchist representatives and elected candidates meet and talk A LOT. Of course, the Berlin administration corporation needs quick decisions sometimes, so when the Senate cannot find an agreement (= ALL THE TIME) the mayor of Berlin (who acts as CEO of the BERVAG) can decide on his own (currently, that's Yilmaz Wojenko, a Psi-Aid man and elected representative of the "normal" district Spandau (a former part of the Aztechnology corporate sector). So there you have it. And if anyone asks about Berlin, please link to this comment and the shadowrunberlin.de website, plus refer to the BERLIN SOURCEBOOK by Pegasus that was published in 2011(? I think) where the whole details of Berlin 2073 are laid down. And if you want an English version of that for 2075+ (SR5), then feel free to tell Catalyst / Jason Hardy – I'd be more than happy to write that up with the help of the other authors. I second those thanks for such an answer! My friends are obsessed with Seattle but I think I'd enjoy a stint in Berlin. Come over. We have good beer, cheap bullets, and free-of-charge body disposal. Dang, I thank you for taking the time to type this elaborate answer. Umso mehr wenn es wider alle Wahrscheinlichkeit meiner nichtvorhandenen Arabisch-Skills dann auch noch (halbwegs?) korrekt ist (und so beweist, dass Undinge wie erzdämliche deutsche Begriffe in englischen Publikationen echt nicht sein müssten, wenn man etwas Google-Fu hat). You are awesome. Great job (theme and elements are perfect) for a great game! This is awesome! 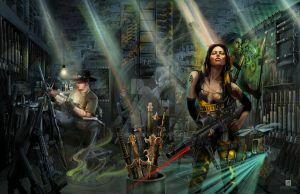 I love Shadowrun and I think you captured the essence and style well. Very modern! Das Sourcebook muss ich mir noch besorgen, geiles Bild, der Hammer! Very nice looking setting and a great ad for a great game! Meanwhile, this picture has appeared in a German newspaper (the "tageszeitung"), decorating an article about future scenarios for RL Berlin. Wow... sehr geil. Fiel mir schon auf den ersten Blick auf, dass es die Ecke um den Kotti sein muss, oder? Aber nicht direkt... hmm.. eine Station weiter oder so. Sehr gelungen. Daumen hoch! Tatsächlich ist es der Görlitzer. Jaaah, genau den meinte ich. Musste da ja auch jahrelang zur Schule raus. What with all the graffiti in Russian (especially that "доигрались" one ) and Russian vehicles? Eurowars fallout? Sort of. Berlin was already swarming with leftovers and refugees from the Eurowars when Anarchy hit the city. Russians are second largest group of foreigners in SR Berlin (after Turks, but before people from Poland). The Vory have strong influence in the city – so do Russian anarchists and communists. Anyway, great job with translations, hope your editors don't mind the obscenities. And really cool and strange is that I know that special place. Great picture. The Görlitzer Bahnhof is one of the better-known corners of Berlin, so that is not THAT big a surprise.